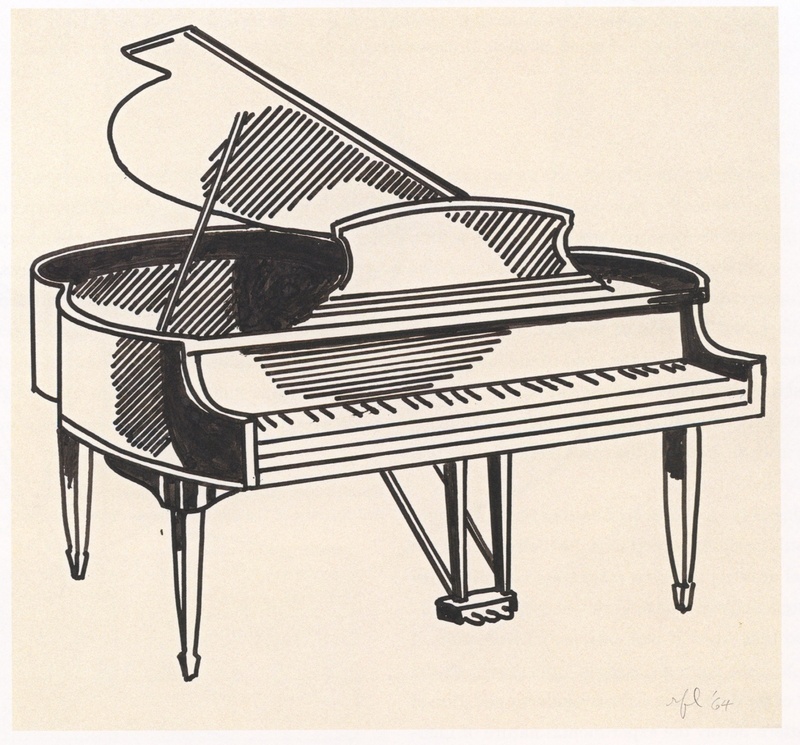 This early ink drawing of a piano was kept by Lichtenstein all his life. No doubt he had his reasons. 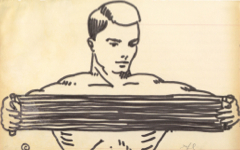 Graham Bader has observed that the first two drawings Lichtenstein made which blatantly rely on commercial imagery were of Donald Duck and Mickey Mouse (both, 1958.) He noted that each is a "carefully orchestrated reflection on the nature of artistic activity itself." He then identified other drawings up to 1963 constructed in the same vein.1 Piano, one he does not mention, is yet another though far more complex. 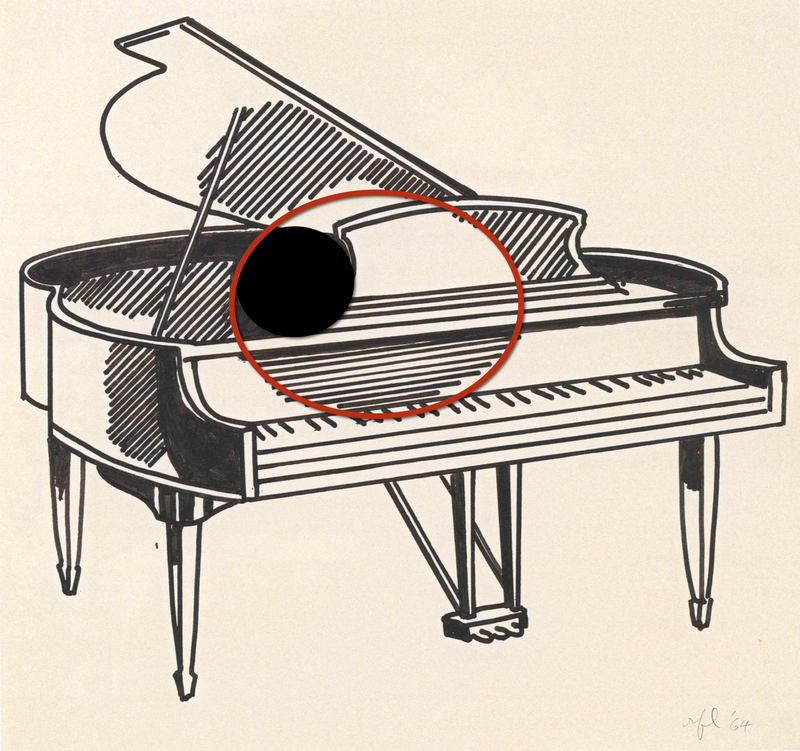 Note, for instance, how the shading and reflections on the lacquered wood of the piano maintain a common contour across varying surfaces to form, in the center of the musical instrument, a giant eye. It is a piano behind the artist's eye, not in front of it. Ever since the early Renaissance artists have used musical performance as a metaphor for the act of painting. Here, the keyboard faces the artist who must be the "pianist" himself since no other performer is in sight. The artist metaphorically playing the piano draws it. Diagram of Lichtenstein's Piano showing the "eye"
As I showed of a contemporaneous drawing, Alka-Seltzer, the artist has also used the shapes of his motif to form his initials, here R for Roy suggested in the curve of the piano lid and L for Lichtenstein in the lyre above the pedals. (He rarely, if ever, used a whole R to convey it. Usually, the curved part alone was enough with the slight indication of a stem.) There might be an alternate L in the lid prop, thereby making an entwined monogram of his two initials. 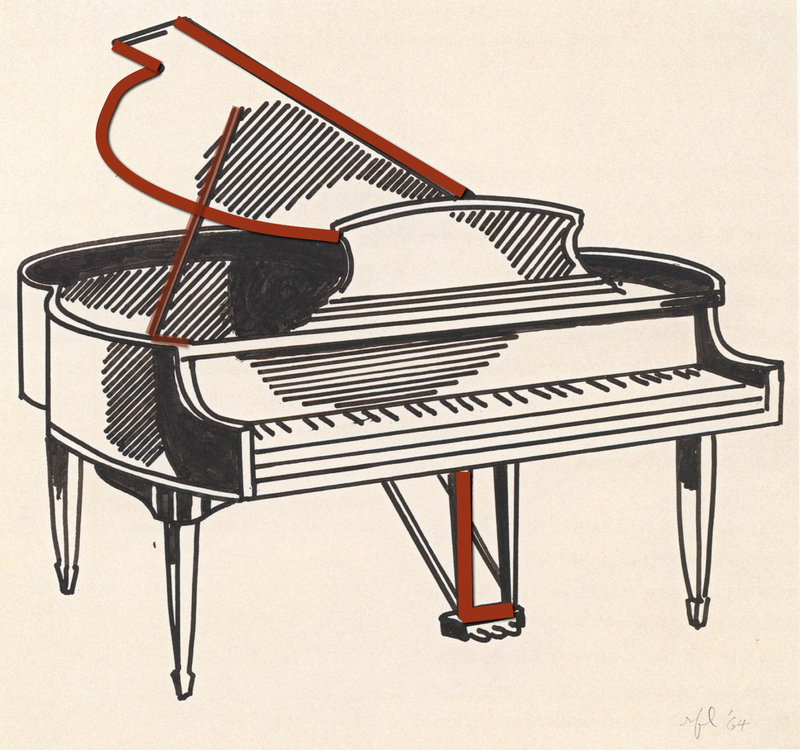 Diagram of Lichtenstein's Piano showing his initials, R and L.
That is not all. 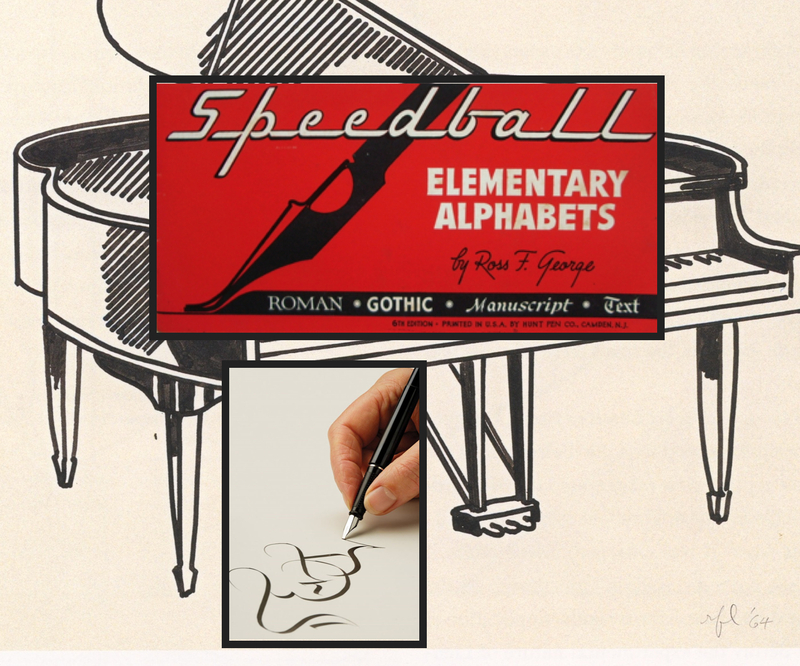 The drawing was made with brush and pen, the latter possibly a Speedball nib and pen holder he used on other drawings. Whatever type he actually used, the piano legs probably resemble them with the shading above dripping down the piano leg like liquid ink. There is so much more in a "simple" drawing by Lichtenstein than anyone (other than other artists, probably) has ever imagined. Study them if you can; they will reward you greatly. 1. I will add an entry on Lichtenstein's Girl with an Accordion (also 1961) shortly in which a similar eye and musical note are included in the shading of the instrument. Original Publication Date on EPPH: 21 Jan 2013. © Simon Abrahams. 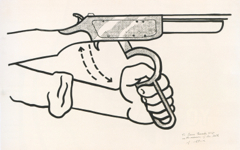 Articles on this site are the copyright of Simon Abrahams. To use copyrighted material in print or other media for purposes beyond 'fair use', you must obtain permission from the copyright owner. Websites may link to this page without permission (please do) but may not reproduce the material on their own site without crediting Simon Abrahams and EPPH.